State-of-the-art technique to directly demonstrate that your compound promotes reverse cholesterol transport and has therefore the potential to prevent cardiovascular diseases. In vivo reverse cholesterol transport using 3H-labeled cholesterol is the best approach to evaluate compounds affecting HDL metabolism and reverse cholesterol transport. Demonstrate beneficial effects of your compound on macrophage-to-feces reverse cholesterol transport. 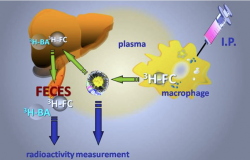 In vivo reverse cholesterol transport using radiolabeled cholesterol is the best approach to evaluate compounds affecting HDL metabolism and reverse cholesterol transport. Briand F. et al. Eur J Pharmacol. 2014, 740: 135–143. Briand F. et al, J Nutr. 2012 Apr;142(4): 704-709. Briand F. et al, Diabetes Obes Metab, 2012, 14(7):662-5. Briand F. et al, Clin Transl Sci. 2011 Dec;4(6): 414-420. Briand F. et al, J Lipid Res. 2011 Nov;52(11):1965-73. Nijstad N. et al, Gastroenterology. 2011 Mar;140(3):1043-51. Tréguier M. et al, Eur J Clin Invest. 2011 Sep;41(9):921-8. Briand F. et al, J Lipid Res. 2010 Apr;51(4):763-70.